Mainly inspired by his fascination of mixing the handmade with industrial design, British designer Julian F. Bond’s exquisite pixel vases and lights all created by the same casting machine, will be featured from May until September in an exhibition entitled Pixel Vases Landscape at the Italian Swing Gallery in Benevento (26 May – 15 September 2012). Julian F. Bond’s homeware brings a fresh eye to design; kitchen vases fashioned with pixels. 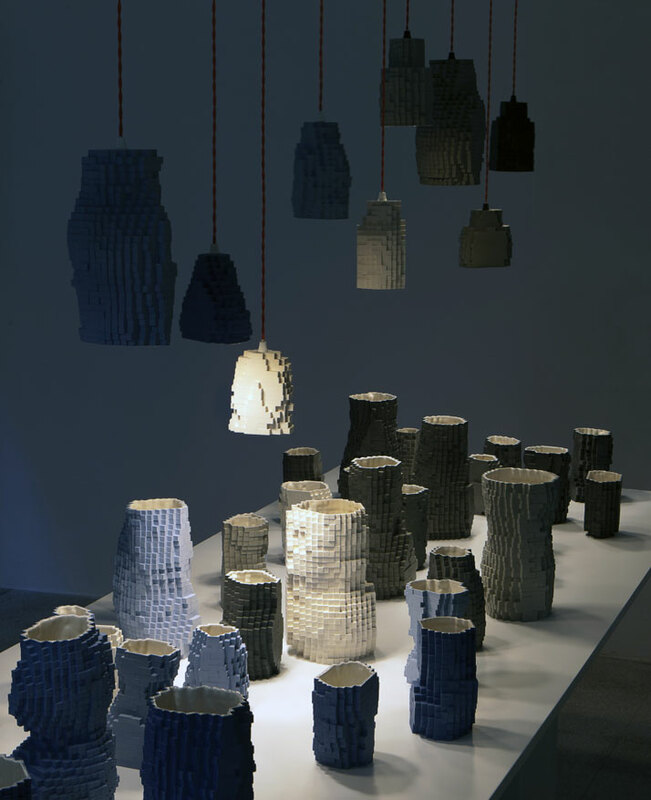 His vessels redeem little squares of digital pixels onto crafts rather than on screen. As his creations are absolutely unique with their truly abstract architectural structure built like sugar cubes, Yatzer simply couldn’t resist taking a closer look at them. 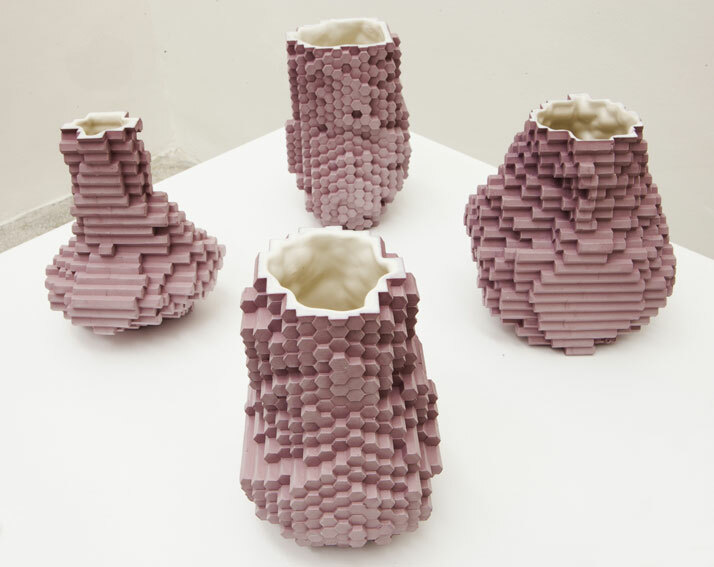 Initially, the pixel mould was Julian’s showcase for the purposes of his MA back in 2010 at the Royal College of Art. 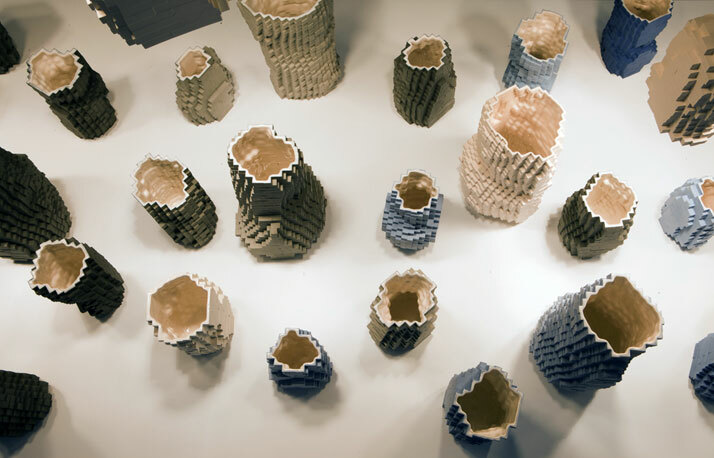 With his pixel vases project, the British designer originally wanted to experiment with the different processes of production through his own post-digital expression. Today he has achieved exactly that by designing a series of vessels, which explore the correlation between design and permitting consumer creation. The current pixel casting machine is the second version of the original cast machine. The redesign is more user friendly and much faster (20 minutes to shape a mold). 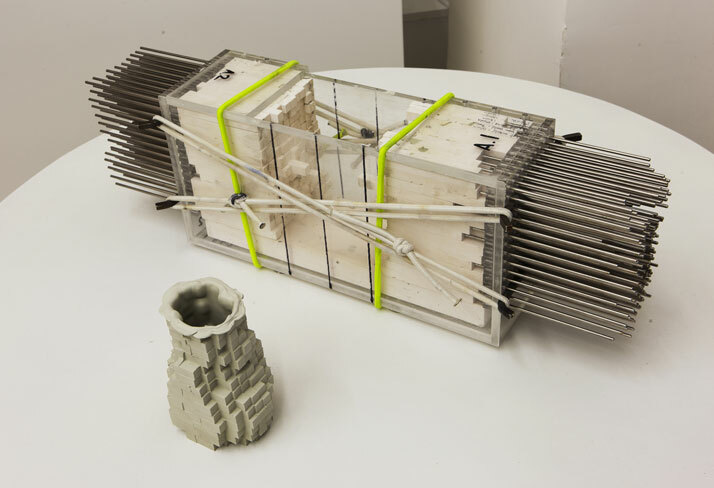 In pottery, ceramists typically use a separate mould for each form, this machine however, uses a mould made up of over 1300 individual plaster sticks, which are separately adjusted to create endless unique designs. The pixel casting machine works as the designer himself says, like ‘a Deus ex machina in the hands of the designer and transforms its role from being only an anonymous mechanical device to the undisputed main character in the creative process. Namely, manual ability redeems itself to industrial mass production……The vases are produced using a coloured slip and only glazed on the interior, this produces a finish that is crisp and shows the detail of the moulding process. Each vase can be adapted to meet the requirements of each use.’ Therefore, Julian’s work enhances the potential of the materials and his designs have long pattern repeats so no two items are exactly alike and their shape remains uninterrupted. As part of the exhibition, a series of vessels made exclusively for the Swing Gallery will also be shown in colours fading from blue to white to grey. Ceramics may enjoy a high international profile, yet one young and ambitious British designer has seen the need to break the tradition by experimenting on the different processes of their production. 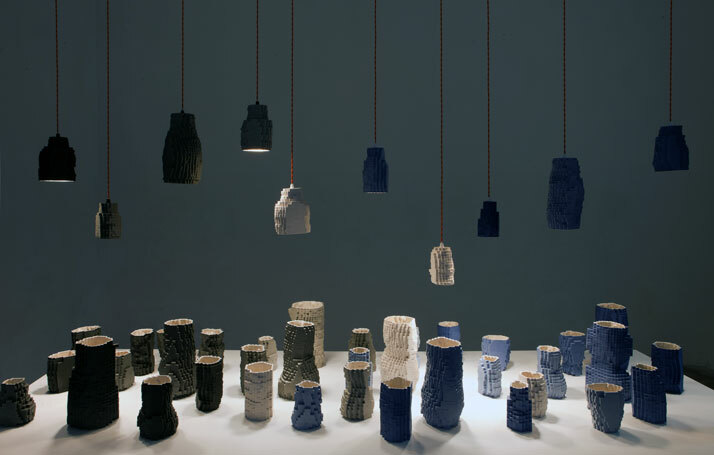 He helps prove that even old ceramic clay, with a little imagination, can be stripped back to its basics. Perhaps because of our constant need to surround ourselves with homely and hip products or because they are so very reminiscent of cityscapes, we truly adore these pixel vases!